Being petite means an everlasting battle with awkward lengths so I usually opt for the shorter. During my trip to New York, I found a midi skirt at Beacon's Closet that was, dare I say the perfect length for a midi. I always make a mental note to stop by the vintage mecca when I'm in New York and I feel like it is better curated in their vintage selection than most stores I've been to. The November weather in Los Angeles doesn't need any more explanation than wearing a slouchy muscle tee with a thick wool skirt but I'm not complaining. You look amazing. Love the grunge. you look so pretty and inspiring! lovely photos as well! I understand how you are feeling. Cute skirt though, you pull this off really well. Digging this outfit. Well plaid, you're so cute. I love love love that skirt and even more love that you paired it with an AC/DC shirt! you look great. Wow super cool outfit. Love the skirt. 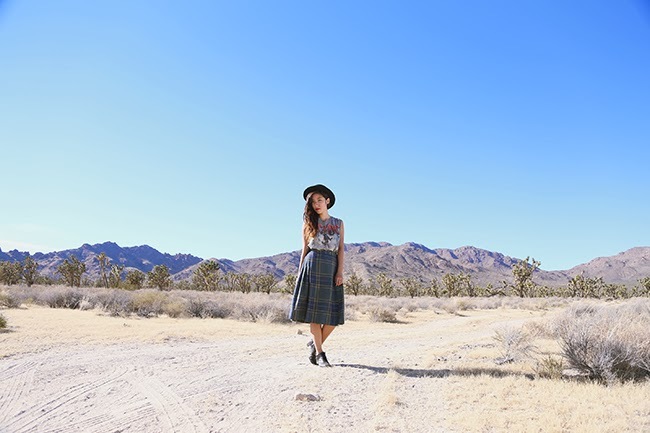 Love the way you added a rocker vibe to such an elegant plaid skirt! Super chic ! amazing! love the skirt with the acdc top..and the hat, lovely! Adore the skirt! Nice pictures! Oh my gosh this is such a perfect outfit! I love it! Thanks for stopping by my blog, would you like to follow each other? I'm a huge AC/DC fan and I'm craving that top!! este look es genial! que guapa! I love this look! Such a fantastic skirt! Love the plaid skirt!! I'm currently on the hunt for one! Wow, i've been looking for a skirt like that everywhere! All they sell are mini skirts :') anyway, really interesting look, keep up the great work. I absolutely adore your style. I am your newest follower.